Home / Resources / Count Us In! Toolkit 2019 / How Can We Engage the Community? If you are in a position to engage the full community in your attendance campaign, the broader approach can amplify your efforts. If possible, work with a cross-sector coalition to advance your plans. Whether you have a coalition or not, find ways to put tools in the hands of other agencies and organizations. Determine who can take on the issue. If your community is participating in an existing effort focused on academic achievement or dropout prevention, such as Campaign for Grade-Level Reading or Grad Nation, tap the coalition in place to engage the community in improving attendance. All the right players might already be involved, or the coalition could consider using attendance as a way to engage additional partners. Reach out to other existing coalitions Networks already organized to reform schools, promote literacy, reduce dropout rates, address health needs and improve communities might offer enthusiastic partnership and leadership around addressing chronic absence. If your districts or schools are tracking early warning indicators, they’re already paying attention to attendance. ￼￼If no coalition exists to take on this issue, then consider launching your own; convene community partners who can help schools improve attendance. Hold a community meeting to discuss ideas and solicit buy-in. Ideally you would provide data on the number and percent of chronically absent students in your community. If your district has not calculated this, then consider registering for these tools. Attendance Works has developed a template toolkit with handouts, activities and local resources that can be easily adapted to help schools and local partners reduce absenteeism. Some communities have adapted Attendance Works materials for local audiences. 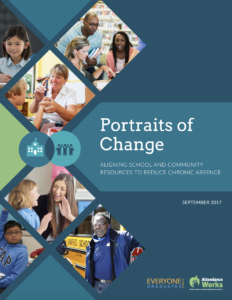 Attendance Works has developed toolkits to guide principals and teachers working to improve chronic absence. Los Angeles and New York City have also created guides. Model some of your ideas on sections in these toolkits.